For many years our favorite camp crafts have been made from clay. First Salt Clay for home made clay we could make into large objects. Then we discovered Sculpey Clay! And the world of adult looking camp crafts began. 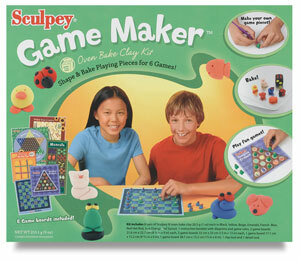 Sculpey is a polymer clay that softens easy for little hands and can be cooked in a regular kitchen oven. They love feeding it into a pasta machine to make flat sheets. We have made: covered pens, Mezuzzahs, Havdalah spice boxes, jewelry, covered baby food jars and covers, light switch plates, tooth fairy jars and more! All ages find making the clay canes of 3d designs magical. I have often had 10 to 12 year olds working almost 1 hour making 1 huge face cane and loving it! Including Clay Picture Transfer Jewelry and MORE! Eileen's Clay Stamp Projects And Ideas. Using rubber stamps to make clay jewelry and more. Many more pictures and techniques inluding Jewish Jewelry, Senior Citizen Crafts and Preschool Projects. Eileen's Polymer Clay Covered Light Switch Covers. Eileen's Clay Chanukah Dreidels and Dreidel Charms. Eileen's Clay On Glass Projects Including some new projects. Eileen's Clay On Paper Mache Projects. Eileen's Clay Covered Yogurt Bottles. Eileen's Clay Covered Jars and Covers. Before we go any further lets not forget regular clay, salt clay, homemade play dough etc. Fun for little hands and reasonable for preschools and schools to use for play and projects. Many people caution the use of utensils and surfaces to be used for clay only. For example, I give every child a sheet of wax paper to work on. I also highly recommend buying a pasta machine for your own use but especially if you work in large groups. It rolls out sheets better, it conditions the clay faster and the kids love using it! 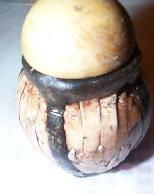 White and Black Clay on Glass Bottle with Wooden Cover. All Antiquing is done AFTER you bake the Sculpey! To Antique to a wooden or ivory look finish, use the Faster Plaster Anituqing. Just paint leave on a second or two and wipe off. If you let it sit too long and it becomes too dark than you like you can wipe off more with a wet paper towel. I like to finish the piece with a sealer. Future Floor Wax is a cheap acryllic seal. Or one of the many gloss or matte finishes by Sculpey, Fimo etc. To antique using a metallic or other powder, use a sealant to make a drop of powder into a liquid form and paint lightly only on areas you want the paint. Let dry and paint with gloss etc. See my Rubber Stamp on Clay pages for more pictures and instructions including Jewish and Other Designs. I have been getting lots of email about how to start using sculpey/polymer clay. I am always trying to find pointers to beginner tips/techniques and label them for you. Many are the techniques I use on my clay projects pictured on my site. Definitions of different Sculpey Clays and the basics for using polymer clay. A cane is a technique of rolling or layering clay to make a design. The design is then thinly sliced to be added to a layer of clay or a little thicker to be applied alone to an object. Some of the canes look like jelly rolls others have complicated designs like faces. All are fun to make and use! As you might be able to tell from my lessons Sculpey is my personal favorite polymer clay to work with children. List for the many kinds of Polymer clay they make: Sculpey, Eraser Clay, Premo, Granitex, Sculpey 111, SuperFlex, Super Elasticlay and more! Their site also includes over 260 projects,* Kids Stuff. Sculpey 301 The Basics of Cleaning a Pasta Machine. Mixing colors and color recipes for Sculpey. Technical Tips that include problem solving issues and lots more techniques. Includes how to cover pens with Sculpey. ( A favorite project of my classes.) What inks work best on Sculpey and more! Teacher's pages for group lessons. I really liked the ones that can be used in a junior high math or science class. I really like the parts of a flower lesson. It also has great kids projects. Many use the economical Sculpey bulk boxes of clay. This is a huge site for the beginner to the professional artist. These lessons from the huge site lists many basic to incredible lessons (with pictures) for making canes. Quality parts/kits for Clay covering projects. Level professional crafter to student. Also has a gallery of pictures for inspirations and links. Site shows some interesting techniques and links to many clay sites. I recommended her basic lessons on the top of this page. Check out her unique lessons for making polymer clay look like stone, roses and faux Turquoise. Also check out her own projects. Lessons, links and artists. Has some great pages for sculpey and other polymer clay projects. Judy Maddigan's Push Molds for Polymer Clay. Even the little ones can use these molds with a little help. We like to use them with Sculpey and Friendly Plastic. Although we never have time to use multiple colors of clay in one mold! Great ideas on this page. Really cute. Using polymer clay to make the rings then adding ladder yarn to decorate. Using home made play dough in science experiments! More videos of Demos for Squishy Circuits, DC Motor and LED, Speakers and Animals!" Plus lessons based on this research on PBS teacher guides for SCIGIRLS! Dough Creatures!Light up your room with electrifing play dough creatures! Precious Metal Clay, Art Clay and more! My New Year's resolution was to learn about the different clays that fire into real silver or gold. For now I am listing links and supply sources as I learn about this advance clay on my clay pages. My goal is to find out enough to make a page for only these metal clays. These clay can be fired in various ways to harden into silver or gold. Some can be fired using a butane torch, a "hot Pot", top of a gas stove or a kiln. The clay is worked similiar to using a single color of polymer clay to make jewelry or and object. The clay is a binder to the silver that disolves leaving behind a silver object. Some metal clays shrink more than others. There is liquid metal clay in syringes to add depth or to repair cracks. There are many books explaining the art of metal clay. Because of the expense, this is probably best as an adult project. Teens may be able to work in a class or with a parent with these clay but because of the dangers in using a butane torch etc best left to the teacher or adult to fire. Many of these sites also sell supplies. Includes video clips, projects for beginners and more. They also have some step by step lessons for making jewelry. They sell supplies and starter kits plus have some great projects with step by step lessons. 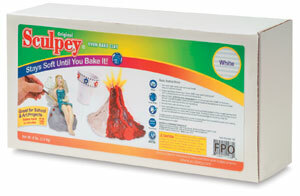 They also sell supplies including wholesale for businesses. They carry the Sculpey 24 pound boxes in white and Terra cotta. They also have frequent sales so check them out! I just got the Game Maker Set. I love the set and the paper game boards! Free 624-page Art Supply Catalog! Also has catalogs for teachers and crafts. They sell Sculpey, Premo, Molds and more! Sculpey and Premo sold by individual bars and some multi bar sets. Back in stock and on sale too! Click on these pictures but you will have to enter Amaco clay oven in their search box. The Amaco Polymer Clay & Craft oven is designed specifically for baking polymer clays and other projects. It has a maximum temperature of 300 degrees, and a 30 minute timer that prevents over baking. I just ordered mine can't wait to get it. My new house oven seems to over bake some items even when using a Sculpey oven thermometer as a guide. So I will try this oven out next. They also sell the Amaco bead baking rack for beads. Made for their clay but I use it with polymer clay. Texture plates, metal cutters, metal pointy tool (to put holes in the clay for a bead etc) But this was for a limited time for Michael's only. Info on care of this machine. I have a couple of the pasta machines below and will now use these for my preschool class and use my motor one for home. My preschool kids wait excitedly in line to use the crank on the pasta machine. Joann.com has more clay and molds!